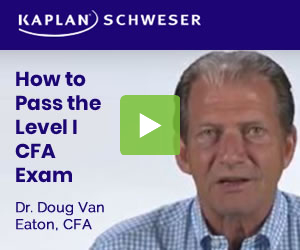 51 days until the CFA exam. Be prepared with Kaplan Schweser. Hi all, this is probably a basic concept I am missing, but need your help to find it. According to CFA Curriculum, the Value of a Price Return Index is V= SUM(n x P)/D, where n is the number of shares, P is the price of each share and D is the divisor. If there is a stock split (let’s say is a 2-1), the share will halve the price, so the new price will be P’=P/2. The CFA curriculum then says that to avoid changes in the index value, the divisor must be adjusted by dividing the sum of all prices after the split by the value of the index prior to the split. V=SUM(nxP)/D is the same as V=SUM((nx2)x(P/2))/D and the divisor doesn’t need to change. Adjusting the divisor would only make sense if the index keeps constant the amount of shares (n) before and after the split. And that’s something I don’t understand. Why they would do that? In a price weighted index the price is for one share, not two. So the index value will change with a stock split unless the divisor is changed. Simplify the complicated side; don't complify the simplicated side.